Your Garden called and said you can buy anything you want! 18 May Your Garden called and said you can buy anything you want! Each May I advise us all to remember, amid the frenzy, that there is nothing so wrong that some really good mulch won’t fix! Didn’t see that one coming did you? I know it’s not the garden advice you were expecting, but a good mulch layer will help you so very much in summer garden maintenance that you’ll want to go back in time and reward your hard working May self with a pot of pansies! Mulches prevent weeds, keep soil temperatures consistent and help reduce moisture loss. They have an added bonus of breaking down into good organic matter that will help replenish your soils too. Mulch just isn’t bark, it can be baled and chopped weed seed free straw (so much less weeding in your vegetable garden! ), or even partially rotted leaves from last fall. If you think spreading mulch is back breaking and labor intensive just imagine how much bending and pulling you are saving yourself by avoiding all those summer weeds! Mulch, what’s not be love? I know you are working in extra-high gear getting the “spring clean up” yard work done. There is always more to mulch, more to fertilize and lets not forget aggressive weeding—my three top chores of the merry-and-not-so month of May But more creative and fun tasks are soon to be at hand! Warmer weather means it’s planting time – but first we have to get all the clean up done! For a quick re-cap: In April, I offered 10 steps to get the cleanup started; if you’re behind (who isn’t? ), refer to the April garden blog for a fast review. Don’t overlook the small spaces! If you’re like me and your backyard is more like a parcel than an estate, you can still create an incredible outdoor oasis even in a small space. Tiny gardens are a BIG trend right now! Small gardens, tiny terraces and petite patios may require a little more thought than larger spaces, but even the tiniest plot can be transformed into an elegant outdoor retreat. Small gardens have many advantages—the biggest is that they’re wonderfully low-maintenance. They’re also great spaces to be creative, as even the smallest additions, from colorful cushions to stylish garden lighting, will have a dramatic effect. Whether you’re in a cozy Cape, a compact condo, or confined to a porch or balcony, or you just want to scale down a bit – we have everything you need to build your small-scale dream garden. Define your space. Start by laying a solid foundation and maximize the area for your sitting space with stylish pavers and wallstone. Once you’ve defined the center space, branch out into walkways and paths. For walkways, lay out gravel paths, stepping stones, or build a solid walkway with pavers. The pathways that wind through my garden of benign neglect are lined with ground covers – the stepable kind. I mostly use thymes, geranium, sedum and epimedium as they are all very drought resistant. Using live plants as pavers isn’t the easiest solution as they do require some maintenance and weeding but I think it’s a great alternative to solid pavers in small spaces like mine. I have a lot of containers in my gardens because my little plot of paradise is very rocky with extremely poor soils. I use pots for color because it’s so much easier on my back! My design (and life) motto is keep it simple. I generally use one plant species per pot. I find the concentrated look of a solid pot of geraniums, impatiens or begonias to be more calming in my small space than the look I would get from multiple plants varieties in each pot. I also love tropicals. Tropical plants, come in a wide range of colors, shapes, and sizes, are perfect for adding drama (family doesn’t own this one alone) to the deck, patio, or balcony. You can leave them outdoors and treat them like annuals, or if you have lots of light in your home, keep them over winter as houseplants to be used outdoors again next spring. Hibiscus, jasmine and bougainvillea all play starring roles on my tiny patio. The plants provide immediate height in late spring that helps add depth to my patio and gardens, essentially making them seem bigger than they really are. Often I am asked why I spend so much money on annual tropical plants like big palms and hibiscus and the answers is simply that nothing perennial is going to give me the look I want. Yes, I could put dwarf alberta spruce in my pots, but looking at the same green conical mass every season is not the look I want. My gardens are small so I get to splurge a little here and there and I choose to do it on tropicals for my patio! When planting your container tropicals, use Fafard potting mix for high levels of organic material and good drainage. 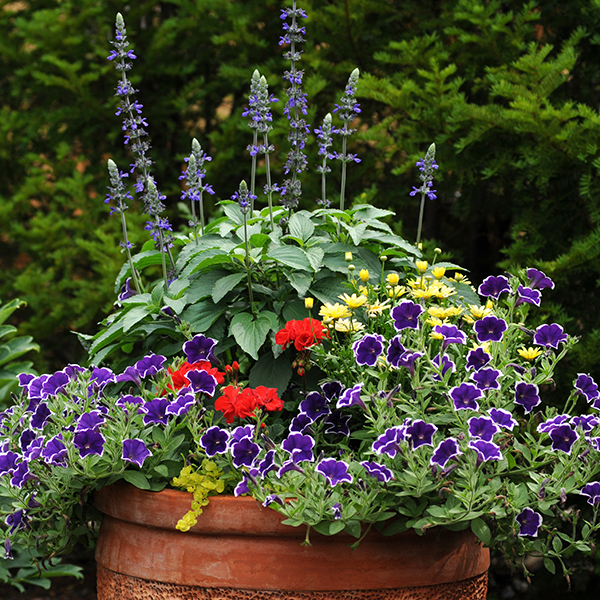 Also take the proper care in watering and fertilizing potted plants. Find a nice balance of watering your tropicals when needed without letting them get too dry or over watering them. Elephant ears and bananas require more water than the other plants mentioned here, so you’ll need to water them more frequently. After potting, fertilize with Osmocote, it’s a 2-month controlled-release fertilizer that will keep your tropicals blooming all summer long. Reap a big harvest in a little space and build a square Foot Garden. Looking for fresh caprese salad this summer, plant some tomatoes and basil! Vegetable gardening doesn’t have to be an acre of lined out rows requiring endless hours of your weekend to maintain. It can be as easy as tomatoes and cucumbers mixed into your flower beds or better yet set out in containers for easy care and harvest! But don’t limit yourself to just tomatoes! Lettuce, beans (on a trellis), peppers, radish and carrots and eggplant are along the many edibles that are easy to pot up and enjoy. You can also grow a mini-orchard of fruit in patio containers if you’re willing to water and feed regularly. Sure, you can walk into the grocery store and toss a bag of nectarines or Honeycrisp apples into your shopping cart, but wouldn’t it be better if you could just walk out your back door? I found a new book, Fruit Trees in Small Spaces by Colby Eierman that has gotten great reviews and is on my must read list for next winter. It’s all about fruit trees and how to grow them, care for them and—the most important part—how to reap the rewards. Best of all, these trees won’t take over your yard. The dwarf options are endless, and many will even flourish in containers. Put a dwarf raspberry or blueberry shrub from Bushel & Berry in a pot and pluck from it this summer. Strawberries in window boxes are another easy way maximize a small space. The Bushel and Berry Collection is completely changing the way we think about berry plants here at Lakeview! They are compact, great for small spaces or pots and, breathtakingly beautiful and produce amazing edible fruit! Then just add furniture, a grill, lanterns and music and you’ve just created your own little bit of paradise! Need more ideas and inspiration? Stop in and visit us for great ideas, new “can’t live without” plants and unusual pottery to put them all in!